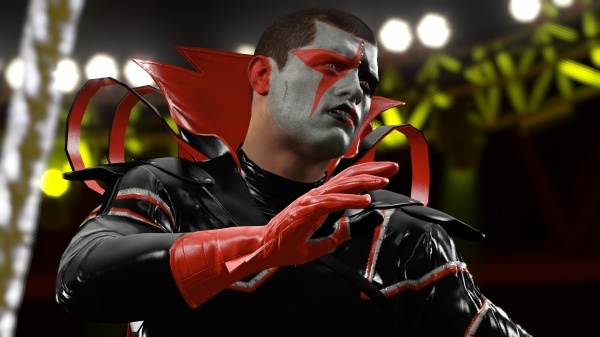 I got the chance to play through a decent amount of WWE 2K16 last month at a press event, and I came away from the experience impressed with the massive roster of playable wrestlers and the laser-focused technical aspects of the bouts themselves. I remembered the wrestling games of the 8, 16, and 32-bit era, where grapples were won by the person who could mash buttons the fastest and the wrestlers all played pretty much the same way. It's pretty impressive to see how far things have come, and WWE 2K16 is clearly aiming to be the most realistic wrestling simulator ever released. Fans had some serious complaints with last year's 2K15, so has the franchise recaptured its glory and satiated a disappointed fan base? All signs point to an emphatic "yes". Before we get to the actual game, I wanted to get the elephant in the room out of the way. When it comes to visuals, WWE 2K16 is probably the best looking wrestling game ever released, but that isn't the glowing compliment it might seem to be. Yes, it looks better than previous games, but previous games didn't look all that great by today's standards, and 2K16 only hits graphical high notes about a third to half of the time. The wrestlers themselves can run the gamut from next-gen perfection to last-gen budget title, and you never really know what to expect about the quality level of what you'll see next. The crowds can look wooden and badly animated while wrestler intros and facial animations look amazing; the fights themselves can seem low-res while the in-game video and cutscenes can amaze, and the exact opposite can be true as well. To say the graphical presentation is all over the place is putting it lightly; even television commercials for the game look, from a quality standpoint, like they are pieced together from a bunch of different titles. Does this affect the game from a gameplay perspective? Not really, but it's jarring to jump from a beautifully animated, extremely realistic sequence to a ringside announcer that looks like she is missing half her polygons. From what I understand, WWE fans were more than disappointed with last year's roster of playable wrestlers. I can't see those same fans being anything but elated with what 2K has brought to the table this year. There are more than 120 wrestlers from all eras to choose from, and that doesn't take into account the wrestlers you can create from scratch yourself. Scrolling through the complete roster is exciting in and of itself; old and new school fans alike will see most of, if not all their favorites. I loved the fact that not only was Bret "The Hitman" Hart expectedly included, so was Jim "The Anvil" Neidhart, his tag team partner when they were The Heartbreakers. Of course Stone Cold Steve Austin was included, but so was Savio Vega, his first real rival in the WWF from before his current and well-known southern badass personality took shape. Even the female wrestlers got in on the action, with a sizable roster for them as well. On a more personal note, it's nice to see that wrestlers who have recently passed, like the Ultimate Warrior and Randy "Macho Man" Savage, were included, and their characters here a fitting tribute to their memory. The last point to hit on the roster is that managers were also included, and can actually be useful (more on this in a moment). Playing as The Undertaker without Paul Bearer is like Kool-Aid with no sugar, so it's great to see that these guys and gals made the cut. Another complaint heard 'round the steno pool about last year's game was the severe shortage of modes to play, and again, this seems to have been fixed up. The amount of content here is seriously staggering; this is the kind of game fans could play for a solid year without uncovering and seeing it all. The Showcase mode is a beast; it covers and lets you play tons of memorable matches from WWF/WWE history, and even features original footage from the broadcasts, tweaking the nostalgia for longtime fans. This mode will also probably be the one you want to tackle first as it unlocks all kinds of stuff, from wrestlers to match styles to enhancements for wrestler entrances and customizable gear. Whereas Showcase mode lets you play through WWE history, Universe mode lets you write your own. Set up like the actual WWE, you'll fight opponents in a quest for the belt in televised Smackdown and Raw matches, and even Pay Per View events. What sells this mode is how the game broadens its focus beyond just you to all the other wrestlers, who win and lose on their own time, affecting your rise to champion. You can watch these fights as a spectator or skip them entirely, a nice time-saver. The style of this mode sells the "show" of the wrestling world and really makes it feel like you are playing as part of the WWE broadcast schedule. Next up is the MyCareer mode, which allows you to create a wrestler and take him or her through the ranks in a quest for the championship belt. This mode has been exponentially expanded over last year's game in both the creation suite and the mode itself. The options for creating your wrestler are very detailed, and the customization also allows players to build their ring entrances, choose rivals and allies and even tag team partners from the existing roster OR other player created characters. Players can also create and customize new match types and championship circuits. At the preview event, we took great delight in creating Gamora from Guardians of the Galaxy to fight with and against cast member Bautista, but in reviewing the game I created a character that more closely resembled myself if I was physically fit and able to fight. In both cases, the MyCareer mode really gives the feeling of being there. The only real drawback here is load times when creating a character. The game chugs to a halt when you are trying out new looks. Previewing your changes is accompanied by a load time with each and every change, and it can get seriously annoying if you are painstakingly creating your perfect look. There are even more modes to discover and explore, but we really need to get to WWE 2K16's extreme technicality and gameplay. If you played the increasingly technical UFC titles, you'll feel right at home here. The game features extremely deep grapple, pin, submission and reversal systems that, when combined, mean that button-mashing is the quickest and easiest way to lose matches. Grappling and arm bars follow a simple rock, paper, scissors type of action as you struggle to come out on top. This takes some getting used to for sure, but feels very natural once you see how it is supposed to work. As an extension of this system, the reversals do a lot to make the game feel more strategic and technical. Wrestlers each enter the ring with a set number of reversal chances, so planning when to use and even recharge them requires quick decisions, especially since the window for each reversal to be effective is gone in the blink of an eye. Winning a match isn't as easy as pounding your opponent and lying on top of their battered corpse. Submissions, when applied, bring up a circular meter. Each player, or the player and the computer, control a segment of the circle, and matching them up for long enough wins the hold. As you might imagine, this is not easy to do; I was unable to score a successful submission at both the press event and playing the game for review. The pin system works similarly, required perfectly timed button presses by the downed wrestler to break said pin. This is a bit more lenient than the submission system, but still not all that easy to nail down. Special matches, like ladder or cage, follow different rules for victory, keeping things fresh and the player on their toes. Finally, the game does feature online play, and matchmaking works well in pitting you against similarly skilled players. Online matches set up quickly and had zero lag time while I tested them out, so it's fair to say that players with online aspirations will be more than pleased. In a game as big as WWE 2K16, I could go on and on about features, matches, unlockables and customization, but I think I've hit the high points. The game's only real misstep is the wildly inconsistent graphical presentation, but the gameplay and amount of features and things to do more than makes up for some occasionally shoddy visuals. 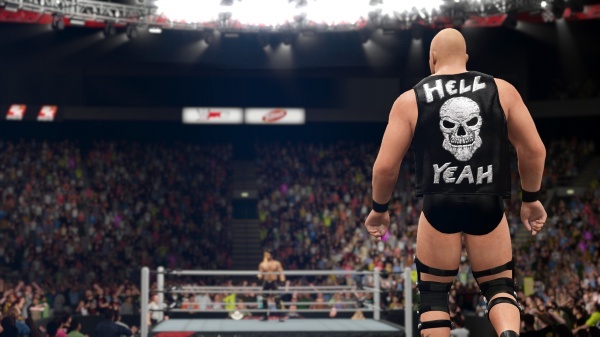 Wrestling fans will find the 2K16 is the wrestling game they've been waiting for, and even non or lapsed wrestling fans will really enjoy the deep wrestling gameplay. In a fall season literally choked with high profile new releases, WWE 2K16 is more than worth your time and attention. Final Rating: 91% - The gameplay will pin you to your couch.